“Seven years ago, it was just Maria, me and a small staff sitting in a room wondering what direction this all could take,” said Carl Bendix, president of JupiterPx/Ambrosia. The “Maria” was Maria Shriver, and the event in question was The Women’s Conference, which Bendix has produced since Shriver became first lady of California. The direction it would take was straight to the top with an extended program, and a stellar lineup of speakers from First Lady Michelle Obama to an encore appearance by Oprah. Shriver inherited a one-day event, which was originally called the California Governor and First Lady’s Conference on Women. Created in 1985 by Governor George Deukmejian as a non-partisan forum to support female business owners, it was a sleepy little happening for several hundred. 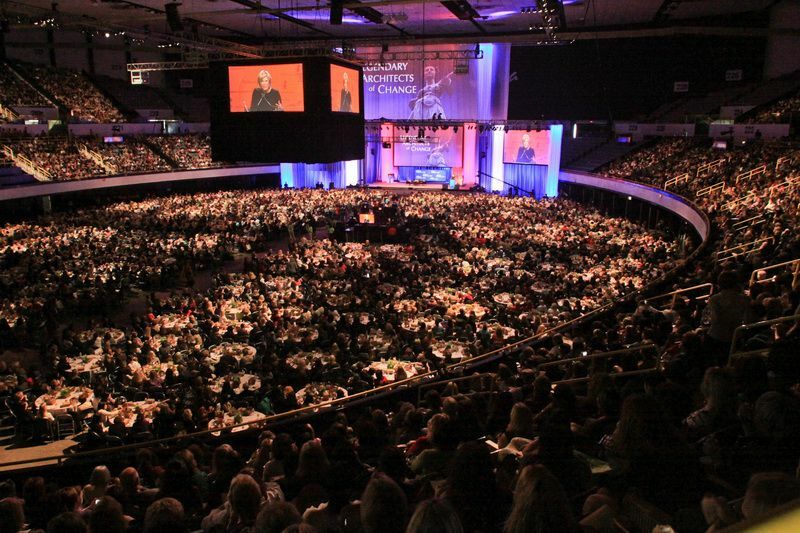 Today, it is one of the largest forums for women in the nation and is known as The Women’s Conference. 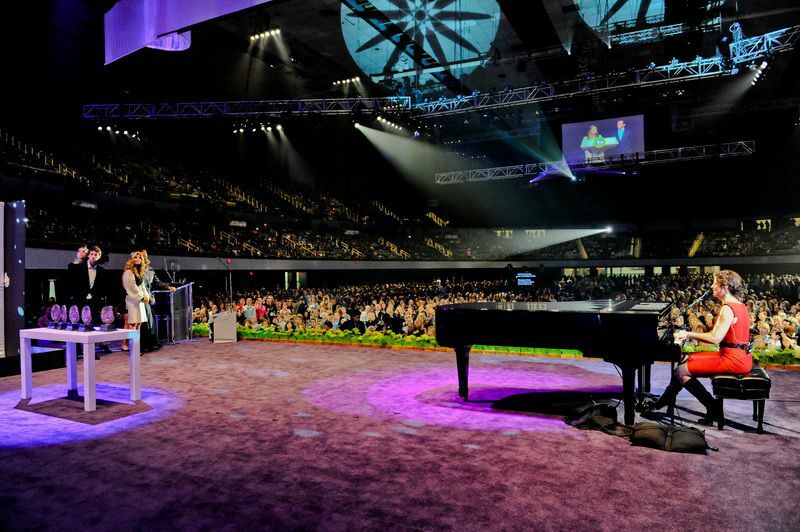 Located at the 160,000-square-foot Long Beach Convention Center, the conference has expanded to three days and has added several annual health and financial programs for women. The main day attracts 14,000 people and sells out within hours. The other events—a Health and Wellness Day, and A Night at the Village bring in another 5,000 people each. Millions more people from around the world now take part in the event via live streaming video. To coordinate all facets of this logistically complex event, Bendix works for about eight months of the year with a team of veteran producers experienced in TV production, politics and large-scale production. Throughout his history with the event, his team of co-producers has remained the same, including Conference Executive Director Erin Mulcahy Stein, Karen Skelton from Dewey Square Group and Alexandra Gleysteen. “We’ve worked side-by-side every year with Maria to interpret her vision,” Bendix says. “Each year we’ve implemented higher and higher production values, and expanded national and international involvement.” And even with that greater world view, the conference has retained the ability to be intimate. It’s part of what makes this event sell out each year within hours. The other part, of course, is Shriver herself, who has attracted speakers such as Tony Blair, Oprah Winfrey, the Dalai Lama, Warren Buffett, Condoleeza Rice and Madeleine Albright. Throughout the years, the stage design for The Main Event has been dominated by large video screens above and beside the stage, creating a dramatic focal point within the large space, called The Arena. For this year’s conference, Bendix again brought in MegaVision Arts to produce graphic and digital elements that supported the program in a variety of ways. Behind the scenes, Touring Video provided an HD production truck and cameras from which a director called the show. For the main show, the Arena was set with round tables on floor level for 3,500 attendees who paid a premium price for the seating. The other 10,500 attendees were seated in the next two tiers of seating for the morning sessions. At lunch time, attendees feasted on gourmet box lunches with a menu designed by Nancy Silverton of La Brea Bakery. At the end of the lunch session, attendees either visited the interactive tradeshow floor (The Village) or participated in breakouts. While this was happening, the Arena floor was changed from rounds to theater-style seating for the Minerva Awards, which were followed by a concert by singer/songwriter Sarah McLachlan. It’s not clear what will happen with the Women’s Conference in 2011 or whether Shriver, Bendix and team will be part of it with a new governor in office. But one thing is clear: the seven years of teamwork between Shriver and Bendix, and between Bendix and his team came into alignment with talent, hard work and innovation to make this conference the most dynamic, influential and memorable event possible. 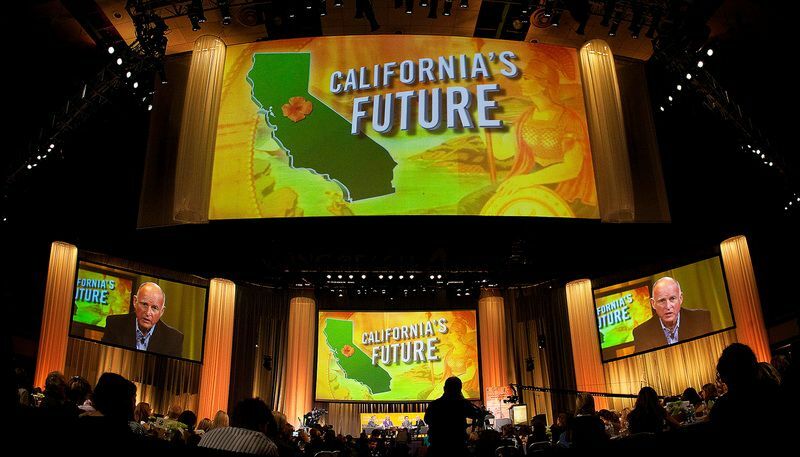 The conference was the setting of the final debate between California gubernatorial candidates. The main stage was transformed into a difference look for this event. Sara McLachlan headlined the Minerva Awards.